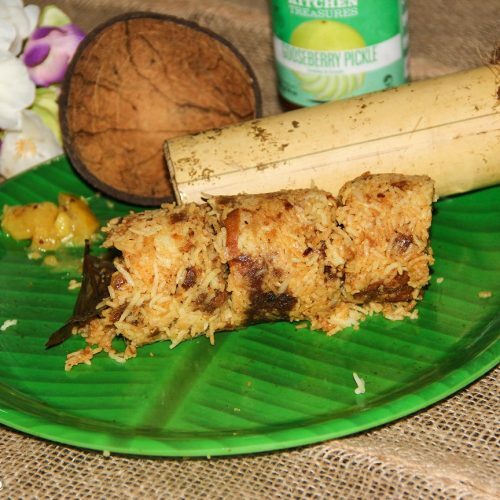 inger your taste buds with the flavorful combo of fluffy rice and chicken blended in aromatic spices and stuffed into a piece of bamboo log and steamed resulting in rich fragrant biryani! 1Clean, wash, & drain the chicken pieces. Marinate the chicken with turmeric powder, chili powder, garam masala powder, chicken masala powder, pepper powder, ginger-garlic paste, yogurt, & salt. Leave it aside for 30 mins. Wash and soak the rice. Boil 4 cups of water. Add 2 tsp of ghee along with the whole spices into the boiling water. Add the soaked rice and mix well. Cook until the rice is half done. Strain the rice in a colander and keep aside. 2Heat a pan and add ghee. Add the marinated chicken. Cover with a lid and cook on low-medium flame for 15-20 mins stirring occasionally. Remove from flame and keep aside. 3Clean the bamboo stem. Place a perforated disc into the bamboo shot. 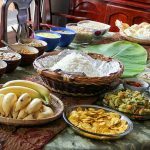 Layer it with 1 tsp of fried onions, 3 tbsp of the cooked rice, 1 tsp of ghee, 2 tsp of the cooked chicken, and a final layer of rice. Press it gently using the back of the spoon. Sprinkle some fried onions and chopped coriander + mint leaves. Close it with a coconut shell as a lid. Place it over the pressure cooker filled with water and steam it for 10-12 mins. Remove the bamboo shot from the pressure cooker. Using a chop stick, gently ease out the log of yummy biryani into a plate and serve hot. Repeat the same process for the remaining rice and chicken masala and enjoy!